Sailplanes are highly engineered aircraft which have the ability to travel vast distances at speeds in excess of 150mph using nothing but the natural energy occurring from the sun’s heat and air movement. Pilots aim to seek out areas where the air is moving upwards, enabling them to gain height which can be converted into distance along the ground. Modern sailplanes can fly hundreds of kilometres in a single flight, using the areas of ‘lift’ like stepping stones to climb and glide. The better the pilot understands how to use the ‘lift’, choose a route and fly the glider – the faster he will cover the distance. Place multiple sailplanes in this situation and a competitive nature will develop, pushing speeds and tactics to the limit. Fixed (Racing) Task – The most common task is a fixed course, typically consisting of three or four ‘turnpoints’. The pilots must fly to each turnpoint in the correct order before heading to the finish line. In European conditions, these tasks can be in excess of 600km. Assigned Area Task (AAT) – An AAT gives pilots an opportunity to pick where they think the best conditions in the sky will be. They will be given large areas they are allowed to fly in, meaning they can pick the best route without being restricted to flying round specific turnpoints. Once these tasks have been briefed, the pilots will line up on the grid to wait for the conditions to become good enough to launch. Once all sailplanes are launched, the competition organisers will open the start line. The pilots can then choose when to start, taking into consideration anticipated weather and tactics. How do you win the race? The winner is the pilot who completes the course at the fastest average speed. The races run like a time trial, so the first sailplane to cross the finish line isn’t necessarily the fastest. In an AAT, pilots will be set a minimum time that they must fly for, so they need to fly as far as possible in this time to increase their average speed. Winning the race requires excellent piloting skills to identify and use the lift that will give them altitude that is then converted into speed. The energy available is constantly changing requiring the pilot to continually evaluate his tactics both in relation to the energy conditions and his position relative to the other competitors. Winning the race requires a pilot to formulate a strategy that suits their competitive style. Some like to race ahead whilst others may wish to fly more conservatively and wait for the leaders to make a mistake. There will be many critical decision points giving each pilot the opportunity to gain an advantage when he makes the right decision and fall behind if he makes an incorrect assessment of the conditions. Each race is a test of the pilot’s tactical ability, physical and mental stamina. These qualities combined with his piloting skills and ability to choose the optimum route will determine his performance. The pilot who successfully implements his chosen strategy and uses the most appropriate tactics to achieve the fastest speed will be the winner. How do you win the contest? Each day the fastest pilot will be awarded up to 1000 points. Other pilots will be awarded points based on their speed in relation to the winner. This means second place could be awarded 999 points or 800 points – it is not a rigid scale. The pilot with the most points at the end of the competition will become the champion. 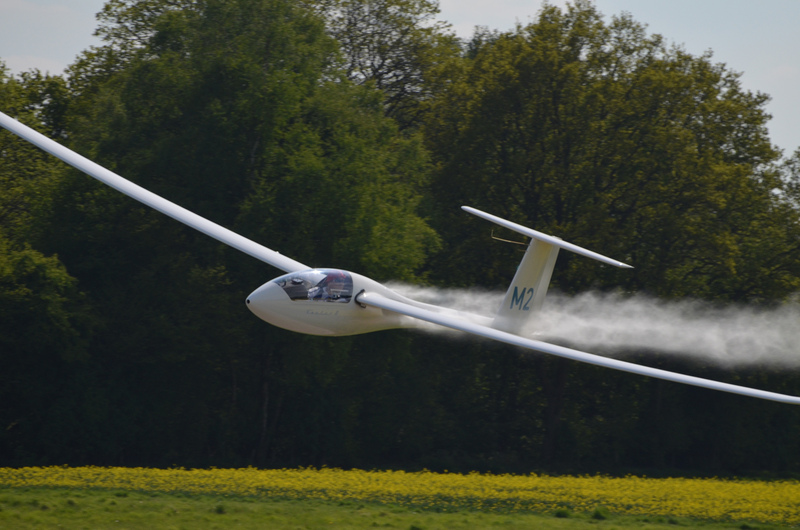 Major gliding championships will attract up to 100 of the best pilots from all over the world. The racing is fierce, often coming down to a matter of seconds even after racing for over 600km. The sport is not simply a race against other pilots – it is a race against nature itself.